BBC NEWS | Science/Nature | What is happening to the Sun? The Sun's intense activity in the past week will go into the record books. 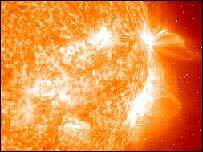 Scientists say they have been amazed by the ferocity of the gigantic flares exploding on the solar surface. The past 24 hours have seen three major events erupt over our star, hurling billions of tonnes of superhot gas into space - some of it directed at Earth. 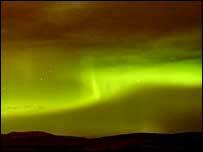 Researchers are once more predicting colourful displays of aurorae - polar lights - when the charged particles from the Sun crash into our atmosphere. On Monday, there was an X3 flare followed by smaller ones. Last week there were X7 and X10 events that took place back-to-back. Flares with an X rating are unusual and, if the gas cloud from them reaches the Earth, are capable of causing a geomagnetic storm. The Earth's changing magnetic field in such a storm can cause power grid and satellite problems. Japanese engineers believe that one of their satellites failed last week because of one such storm. Last week's flares came from giant Sunspot 486, as did the first flare on Sunday. Subsequent flares have emanated from Sunspot 488 which appears to be growing in activity. Some experts are saying that the Sun is more active than it has been in living memory. Dr Paal Brekke, deputy project scientist for the Solar Heliospheric Observatory (Soho) Sun-monitoring satellite, told BBC News Online: "It is quite amazing that the flaring regions continue releasing such strong flares. "I think the last week will go into the history books as one of the most dramatic solar activity periods we have seen in modern times. "As far as I know there has been nothing like this before." Skywatchers will be looking out for spectacular lights in the night sky. These Northern and Southern Lights are generated when fast-moving particles (electrons and protons) ejected from the Sun get trapped in the magnetic field around the Earth, and collide with the gases in the upper atmosphere.